If you have any questions or want to enquire about dates, use our form to contact Paul Jarrett & Clare Livens or see their website for more information. Your comfort is Paul and Clare’s priority. They’ll happily run you and the kayaks up to Sudbury for a day on the river, or lend you bikes and give advice about where to cycle. There are wonderful walks straight from the door too – return to chocolates and fruit cake in your room. 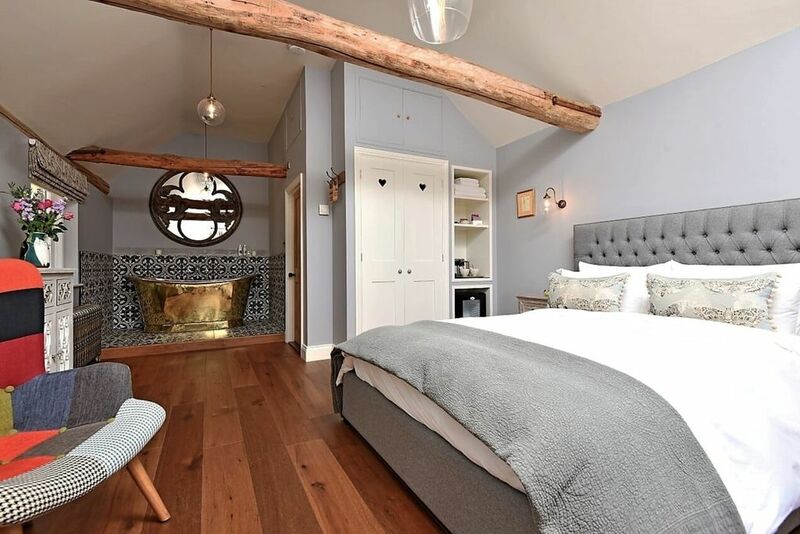 Attention has been lavished on the guest bedrooms in the converted cottage by the front gate. The Melford room has views over the Tudor turrets of Melford Hall and a great brass bath. The Garden room has its own log-burner and a private walled garden. Everything under the old beams is bespoke, interesting, immaculate. Ask your hosts about the rich history of the house and its most famous occupant, the WW1 poet Edmund Blunden – they’ll show you his first editions. You have a generous and relaxed breakfast in the main house conservatory; forget the car and spend days enjoying the village treasures and shops; stroll out to a different place to eat each evening. Special offer: Enjoy a delicious half price cream or savoury tea at Tiffins in Long Melford when you book with us! A great offer at just £5.50 for 2 people!!!! Minimum stay: 2 nights at bank holidays. 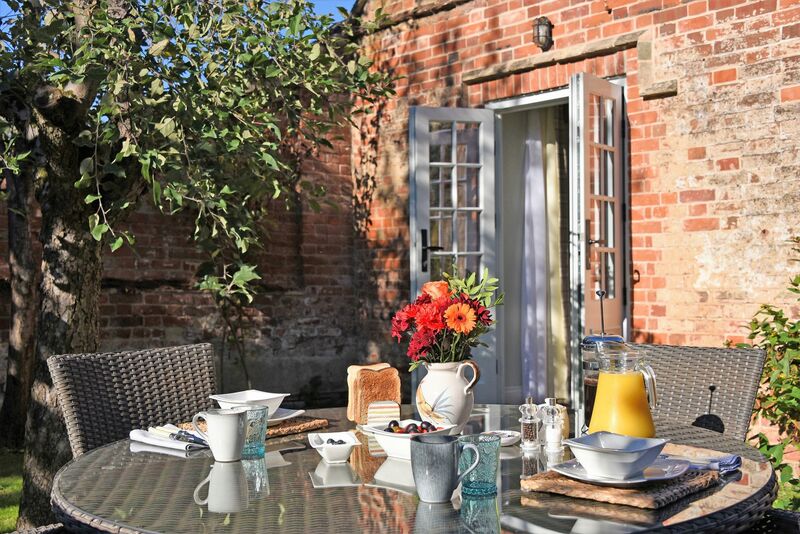 Garden Room: 2 nights at weekends April-September. Very warm welcome with practical and full explanations and suggestions. Paul and Clare are paying a lot of attention to detail. Room with ensuite bathroom has been modernised to a high spec with walk-in shower and special features such as illuminated wash basin and shower niche's with fade possibility. Although on a busy road the room had been virtually 100% soundproofed and had access to a very nice little walled garden which traps the sun in the morning and should be very pleasant in summer. Off-road parking, excellent breakfast and overall very enjoyable stay. Wow! Just the most fabulous place to stay - so much care and attention to detail have gone into making this a truly memorable experience. 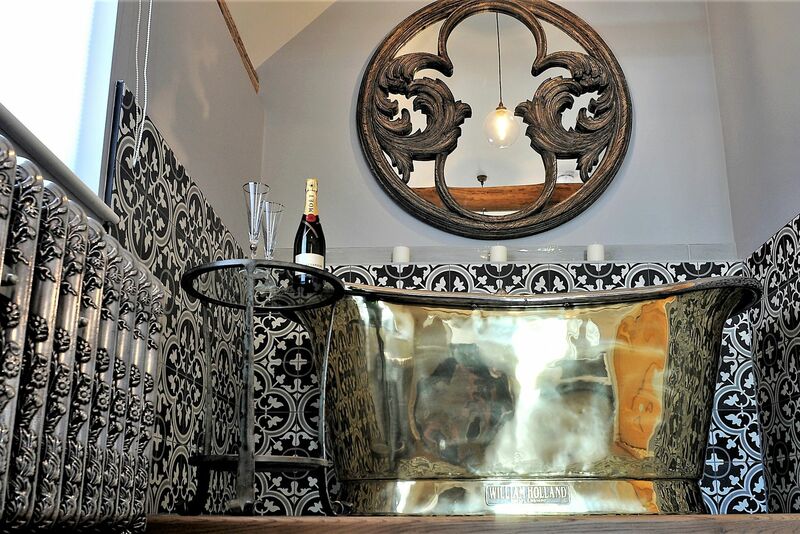 Everything has been thought of; mood lighting over the brass bath, gorgeous toiletries, a log burner in one of the rooms; your own garden or patio and of course a wonderful breakfast every morning with eggs from the resident chickens. Lovely. The Mill is in the centre of Long Melford with its 2.5 mile High Street, choice of places to eat, art and antique shops and lively summer Street Fair. It’s next to the NT’s Melford Hall and close to Kentwell Hall with its rare breeds farm. The Bull is a minute’s walk; for fine dining it’s 2 minutes to 5* Scutchers restaurant. This is Constable Country: Dedham Vale and Flatford Mill are 40 minutes in the car; medieval Clare and Lavenham 5; Aldeburgh 50. Its all about location! Gaze from your room or private garden toward the soaring spires of Melford Hall. A couple of steps east from The Mill brings guests to the square pond and moat of the Hall; look out for swimming swans and Muntjac deer. Sample great food in numerous eateries and sip craft beer in our very own brewery overlooking wheat fields. Long Melford has a fantastic choice of bars and restaurants with some outstanding fine dining options all within 5 minutes walk from The Mill. Do you like to walk, paddle or cycle? The Mill provides free bikes & kayaks to explore nearby areas, so you can get lost on a hot summers day in Constable country! Explore Flatford Mill, Dedham &Stoke-by-Nayland; paint your own picture of sleepy Suffolk! Long Melford is renowned for having an excellent variety of independent shops & vibrant art galleries. The TV series 'Lovejoy' was filmed in the village so prepare to search for treasures and curios in some colourful and quirky shops. Immerse yourself in the writings of the war poet, Edmund Blunden, whom lived and died at The Mill. He wrote some of his works in The Garden Room and was a professor of poetry at Oxford University. The Mill holds a small collection of his 1st edition works. Step back in time at Kentwell Hall, a romantic, moated, red brick Tudor mansion in a tranquil setting. Just a 20 minute stroll from The Mill, Kentwell offers a myriad of special events that appeal to everyone, and has delightful formal gardens to explore. Paul and his wife Clare fell for the charms of Suffolk, moved to Long Melford in 2005 and began to apply their creative drive to renovating properties. They completed work on their Grade II listed Mill in 2018; past occupants would surely approve: the World War poet Edmund Blunden lived here for a few years before he died in 1974; the American artist Mark Miller, who married Blunden’s daughter, spent time here too.